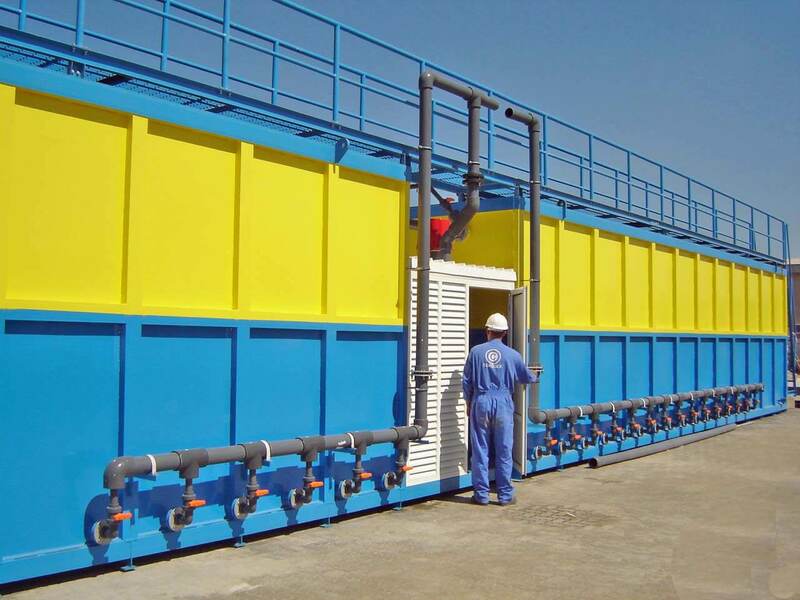 Corodex has done extensive research into Moving Bed Bio-Reactors (MBBR) to optimize the process. Essentially, the EFLOMBBR system is a biofilm process. Biofilm processes in general require less space than activated sludge systems because the biomass is more concentrated. The MBBR process relies on the use of small plastic carrier elements that are kept in constant motion throughout the entire volume of the reactor to enhance biofilm growth. The high surface area media is employed in both Integrated Fixed Film Activated Sludge (IFAS) and moving bed biofilm reactor (MBBR) configurations. In IFAS mode, the MBBR enhances the simultaneous growth of suspended biomass and biofilm inside the system. Corodex offers a fixed film biological product line: EfloMBBR™, EfloIFAS™ and EfloHYB™, with a broad range of different carrier types in order to cater for the specific needs of different applications. EfloMBBR™ is a compact, versatile and operator-friendly technology that features cost-effective contaminant removal practices. EfloIFAS™ is an excellent upgrade solution for an activated sludge system, SBR or extended aeration process struggling with increasing loads, and for municipal sewage treatment plants to promote nitrification and reduce the load on the secondary clarifiers. As such, the capacity of an existing treatment plant can be increased without increasing the footprint. EfloHYB™ is a variance of the MBBR process specifically designed for industrial applications that have high strengths, variable flows, and shock loads. EfloHyb™ carriers ensure a very high protected surface area with a controlled biofilm thickness. EfloHYB™ can act as a pre-treatment for overloaded existing industrial wastewater treatment plants.